Mongolia is a vast country spanning the steppe and deserts of Northeast Asia. Having maintained much of its centuries-old nomadic traditions, Mongolia is one of the only places on earth you can interact with true nomadic peoples, whilst riding traditional Mongolian horses. Hidden Trails have a range of authentic Mongolian horse riding holidays for you to experience – from the lands of Genghis Khan to the untouched Gobi Steppe and Khan Khenti Protected Area. 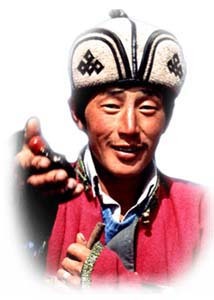 Mongolia is a land still wrapped up in tradition and a nomadic lifestyle. Although low on distinctive, historical "sights," it is of significant interest to those seeking a unique culture, rough scenery and wildlife. Our Hidden Trails horse treks take you through the country, where you’ll find camping in the traditional gers are a perfect way of discovering the traditional Mongol way of life. Mongolia has a unique and durable traditional culture, centered on the herding lifestyle. Herders remain semi-nomadic, moving their animals with the seasons as they have for centuries. Half of Mongolia's population is rural, and tending to livestock remains the backbone of the Mongolian economy. Join us on an epic horseback vacation adventure on the tracks of Genghis Khan. The Gobi Steppe is the only remaining untouched steppe in the world, still wild and unyielding and home to traditional nomadic herders. On our Gobi Steppe Ride, you can live like a Mongolian herder, and experience the “Land of the Blue Sky”. In the Khan Kentii Protected Area follow the trails of nomadic horsemen, whilst riding hardy Mongolian horses. Our Mongol Horse Trails and Big Sky Trail give you an insight into this unique and vital way of life. For most of the year it is very cold, especially at night. Precipitation is low and skies are usually clear during the wintertime. Summers, however, are very pleasant just as in the US and Europe. There is a short rainy season in July and August during which most of the yearly rain falls.